(Newser) – Call it the tamer (and more romantic) version of the Mile High Club, before the plane even left the ground. The Independent reports on an airline pilot who decided to surprise his flight attendant girlfriend, who works with him, two days before Christmas. As Jon Emerson, 24, gave passengers weather, altitude, and turbulence details before their SkyWest flight took off from Detroit to Oklahoma City, he suddenly changed the subject. 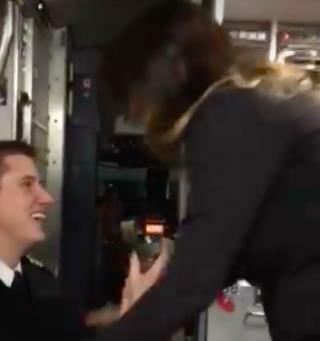 He introduced 23-year-old Lauren Gibbs as his girlfriend, and also as "one of our very best flight attendants," then said he wanted her to not only remember this day as their anniversary, but also as a "day to be known for the rest of our lives." Heh-heh....... wonder if he got in a “quicky” in one of those narrow toilets. The relationship prob won’t last anyways. They might be traveling apart too much. Imagine that noise going through the plane’s intercom. Yong, dumb and full of c..! He will sorry for the spectacle till the biter end! Stop hogging the gate, we trying to go places.